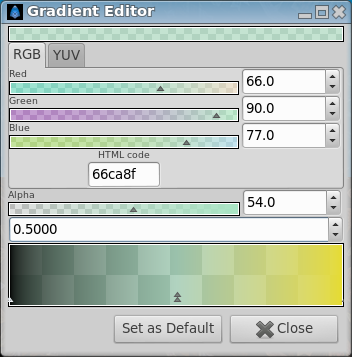 In the Gradient Editor Dialog below the preview area there are two small triangles, called "Color Stop", that denote the initial and final colors of the gradient. The currently selected "Color Stop" is displayed as a white double triangle. Its color is shown in the top part of the dialog for editing. You can select any of the other Colors Stop by clicking on their triangles to edit the other colors of the gradient. You can have a look to Gradient Editor Dialog for more infos about the "Color Stop" in Synfig. This page was last modified on 5 July 2014, at 15:14.